I got together with some very special women at my friend Lisa's house last week. 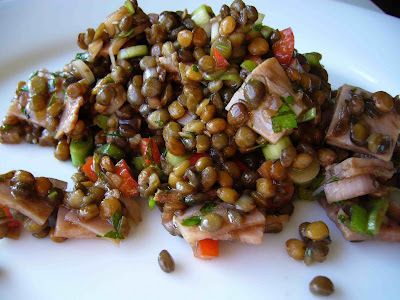 She hosted us for dinner and along with an amazing, homemade gazpacho, made this lentil salad. After getting her permission to make the salad for Apples and Butter, she graciously shared the recipe with me and I learned that it's a recipe of her mother's. I love those handed down recipes because only the best survive! I made a few changes to the recipe, certainly not because Lisa's needed any improvement (her's was truly perfect), but it is back-to-school healthy week so I left out the bacon and cut down on the amount of oil just a bit. Combine the shallots (correction from scallions previously listed here), garlic and balsamic in a small bowl and set aside. Mix the lentils with the ham, parsley, scallions, bell pepper and stir. Mix in the balsamic mixture along with the olive oil and stir to coat. I couldn't resist diving in right away and having some, but I found that this salad got even better after all the flavors had a chance to meld. Enjoy! Yum! I love lentil salad but have never made it myself. I think you've just given me the motivation I needed. This sounds like a perfect early-fall treat! This looks great! Your pictures are so nice. I've got so much basil I'm going to make the palmiers too. Thanks! What a great looking salad. I love salads made with lentils. Yummy!